Istanbul is Europe's most exotic city, at the edge of Europe where east meets west. Can you still travel from London or Paris to Istanbul by train? Of course! The train journey is remarkably straightforward, safe & comfortable, see the video guide. 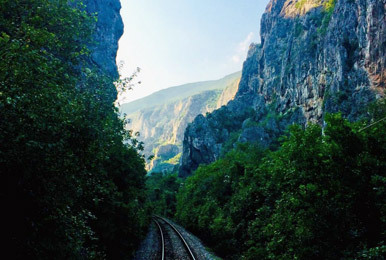 Yet it's also an epic 2,000 mile 3 or 4-night adventure, rediscovering some of the mystery, intrigue and romance of long-distance train travel through the Balkans. On this page you'll find an easy step-by-step guide to planning, booking & making a train journey between London or Paris and Istanbul, one-way or return, eastbound or westbound, with schedules, fares, what the journey is like, suggested stopovers and how to buy tickets. GMT+3. No longer any daylight saving time, as of 2016. If you are a UK or EU citizen, see the see the visa information below. Turkey has a new e-visa system, buy your visa online at www.evisa.gov.tr. 16 April 2019. Train times valid 9 Dec 2018 to 14 Dec 2019. London to Istanbul via Bucharest, or via Belgrade & Sofia? Speed & cost. Both routes originally took 3 nights, but timetable changes in Romania and now in Bulgaria mean that you may need to spend a night in Bucharest or Sofia between trains, so both routes often take 4 nights with little to choose between them in terms of speed. In the eastbound direction, a 3-night trip is theoretically possible via Bucharest if you make the 50-minute connection between the Budapest-Bucharest train arriving 12:05 and the Bucharest-Istanbul train departing 12:40, but that's really too close for comfort. Cost-wise, the two routes are pretty similar too. Quality & comfort. There's little difference here either. In summer, only a couchette car operates Bucharest-Istanbul with 4-berth compartments (although you can book 4 tickets for sole occupancy), whereas both a couchette car and more comfortable sleeping car with 1 & 2 bed compartments operate Sofia-Istanbul. In the off-season, the direct Sofia-Istanbul sleeper & couchette car still operate, but the Bucharest-Istanbul 'train' becomes a series of connecting day trains finally connecting into the Sofia-Istanbul sleeper & couchettes at Dimitrovgrad late at night, which again tends to make the Sofia route the more comfortable option. The weak point of the Sofia route comfort-wise is the relay race of trains between Belgrade and Sofia in the off-season in place of the direct train, details in the journey text below. Stopovers. Even if you travel as quickly as the train schedules make possible, the 4-night Bucharest route gives you a day & night in Bucharest. The 4-night Sofia route gives you an evening in Belgrade and a day and night in Sofia. But if you're not in a rush, you may well want to stop off at other places on the way and the choice of stopovers may determine your route. On the Bucharest route you can stop off in Munich, Salzburg, Vienna, Budapest, Sighisoara (a walled medieval town in Transylvania) & Brasov (for Dracula's castle), Bucharest, and Veliko Tarnovo (Bulgaria's ancient capital). The Sofia route offers stopovers in Munich, Salzburg, Ljubljana, Zagreb, Belgrade, Sofia, or you could also stop off in Vienna and Budapest if you routed yourself that way en route to Belgrade. History. The classic Simplon Orient Express route to Istanbul was via Belgrade & Sofia. The Orient Express and Simplon Orient Express would have gone this way in the 1920s, 1930s, 1950s & 1960s. 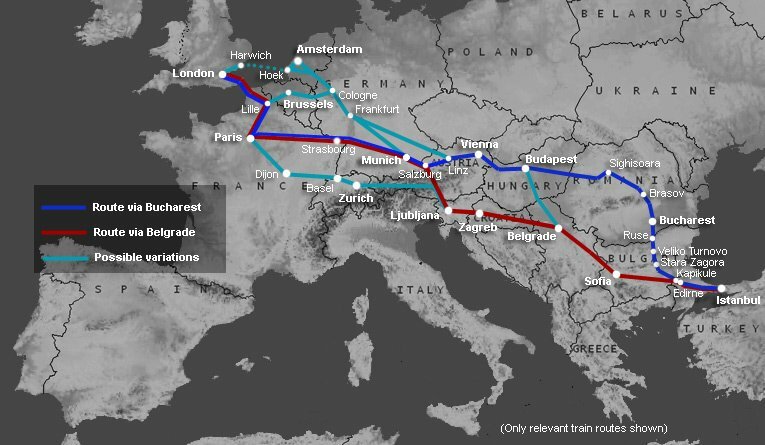 It's possible to retrace the whole of the Simplon Orient Express route (Calais-Paris-Lausanne-Milan-Venice-Zagreb-Belgrade-Sofia-Istanbul) but these days faster and more comfortable to go via Paris, Munich, Salzbur then Zagreb rather than Paris, Lausanne, Venice then Zagreb, see the route map above. Having said that, the Bucharest route is not without its Orient Express history. The very first Orient Express in 1883 ran Paris-Vienna-Budapest-Bucharest, initially with a ferry connection from Varna (and later Constanta) to Istanbul, and later still when the railway was completed, running direct to Istanbul via Bucharest. Only in the Twentieth century was the train diverted via Belgrade. For more historical information, see the Orient Express page. 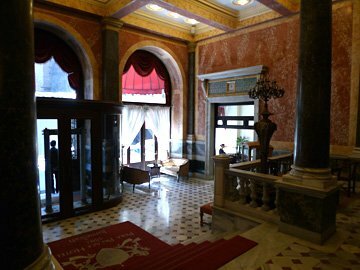 If this aspect of the trip interests you, you'll also want to stay at the famous Pera Palas hotel. In conclusion, there's very little practical difference between the two routes in terms of time or cost. If you relish the chance to see Transylvania & Bucharest as well as some great scenery in rural Bulgaria, you should travel via Bucharest. On the other hand, if you want to retrace some of Agatha Christie's traditional Orient Express route and travel in the comfort of the all-year-round Sofia-Istanbul sleeping-car, you should travel via Belgrade & Sofia. Both options are explained below. The last part of the journey into Istanbul has been affected by engineering work since 2012, while they revamp the tracks in connection with the Marmaray tunnel project to link the rail networks in Europe & Asia, see http://en.wikipedia.org/wiki/Marmaray. Trains run to Halkali, a suburban station 25km west of central Istanbul, with free bus transfer to Istanbul Sirkeci station. Sadly, Istanbul's historic Sirkeci station was permanently closed to mainline trains as from 1 March 2013, to allow lines to be rebuilt in connection with the Marmara Tunnel project. It's long-term future is in doubt, it may become a museum, and it may or may not lose its train tracks. It is possible that the mainline international trains will permanently terminate at Halkali, although once the project is complete you'll be able to use a suburban train between Halkali and a new underground station in central Istanbul near Sirkeci. This section explains the train times, the cost, what the trains and the journey are like, and how to arrange tickets. For the faster 3-night route via Belgrade & Sofia, click here. If you'd prefer to travel via Brussels & Cologne rather than Paris & Munich, or would prefer to take a ferry via Harwich-Hoek van Holland instead of Eurostar, no problem, see here for details. Day 1: Travel from London to Paris by Eurostar, leaving London St Pancras at 10:24 on Mondays-Fridays & Sundays arriving Paris Gare du Nord at 13:47, or at 09:24 on Saturdays arriving Paris Gare du Nord at 12:47. By all means take an earlier Eurostar if you'd like more time in Paris or if it has cheaper seats available. In Paris it's a 10 minute walk from the Gare du Nord to the Gare de l'Est. If you choose option 2 below which involves an overnight stop in Munich, you can also take the 12:24 Eurostar from London to connect with a 17:55 Saturdays-only TGV Duplex from Paris to Munich arriving 23:29. Day 2: Travel from Budapest to Bucharest on the sleeper train Ister, leaving Budapest Keleti at 19:10 and arriving at Bucharest Gara de Nord at 12:30 next morning (day 3). Ister is the ancient name for the River Danube. The Ister has a modern air-conditioned sleeping-car with safe, comfortable & carpeted 1, 2 & 3-bed compartments with washbasin, plus several deluxe compartments with 1, 2 or 3 beds and private shower and toilet. It also has 4-berth & 6-berth couchettes (basic flat bunks with rug and pillow) and ordinary seats. Travel in ordinary seats is not recommended. A couchette is fine, but a bed in the sleeper is the recommended option. Sleepers can be converted to private sitting rooms for evening/morning use, and there's a shower at the end of the corridor which may or may not work. Take your own picnic and bottle of wine along, although a Romanian bar-bistro car is attached in Romania which can serve a cooked breakfast. The train crosses Transylvania by night, calling at Brasov (for Dracula's castle) at 09:30 next morning, well worth a stopover, before ascending the pass through the Carpathian mountains, a wonderfully scenic and almost Alpine section of route. A same-day connection between Ister and Bosfor is now far too tight, 12:30 to 12:40, don't risk it. So stay stop over at Bucharest for 24 hours, and continue to Istanbul on day 4, as shown below. In Bucharest, the Hotel Ibis Gara de Nord is walking distance from the station, inexpensive and gets reasonable reports. 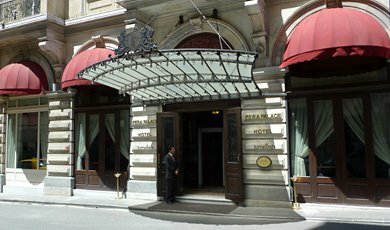 Search for other hotels in Bucharest. The Bosfor leaves Bucharest Gara de Nord at 12:40 and arrives Istanbul Halkali at 07:40. 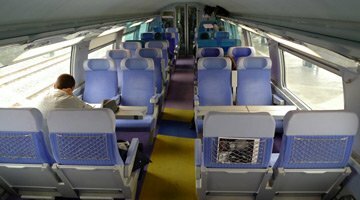 The train has a modern air-conditioned Turkish TVS2000 couchette car with comfortable 4 berth compartments. The train travels across Romania and over the Danube into Bulgaria on the world's longest steel girder bridge, 2.5km long. It then meanders through the lovely scenic valleys of Bulgaria into Turkey. Bring your own supplies of food and beer as there's no catering car. But it's a lovely ride, have your camera to hand. If you want to stop off at Veliko Tarnovo, the ancient Bulgarian capita for 24 hours, the train calls there at 20:43, it's well worth a stop. Be prepared to get off the train at the Turkish border at Kapikule late at night to buy a tourist visa and get your passport stamped, the train arrives at Kapikule 03:16 Turkish time and leaves again at 03:50. You arrive at Halkali, a suburban station 25km west of Istanbul on day 5. TCDD (Turkish Railways) run a transfer bus from Halkali to Istanbul Sirkeci in connection with this train, leaving Halkali at 08:00 and arriving Istanbul Sirkeci at 09:00. Rail tickets and passes are valid on this bus. If you prefer to go direct to your hotel by taxi, this will cost around 60 YTL (€16) but have Turkish lira with you as there is no ATM at Halkali. Step 1, travel from Bucharest to Dimitrovgrad in Bulgaria on a series of connecting trains, leaving Bucharest Gara de Nord at 12:40 on an air-conditioned express railcar, changing trains at Ruse (arrive 15:25, depart 16:25) & Gorna Orjahovitsa (arrive 18:20, depart 20:25) to arrive Dimitrovgrad at 00:15. Times may vary, but it should all go like clockwork. Just before Ruse the train crosses the Danube between Romania & Bulgaria on the world's longest steel girder bridge, 2.5 km long. You then meander through the lovely scenic valleys of Bulgaria into Turkey. Bring your own supplies of food and beer as there's no catering car. But it's a lovely ride, have your camera handy. If you want to stop off at Veliko Tarnovo, the ancient Bulgarian capita for 24 hours, the train calls there at 20:42, it's well worth a stop. Step 2, travel from Dimitrovgrad to Istanbul on the Sofia-Istanbul Express, leaving Dimitrovgrad at 00:44 and arriving Istanbul Halkali at 06:49 next morning. 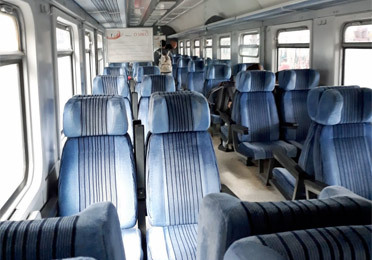 This train has comfortable Turkish TVS2000 air-conditioned sleeping-cars with 1 & 2 bed compartments and a Turkish TVS2000 air-conditioned couchette car with 4-berth compartments, see the photos below. 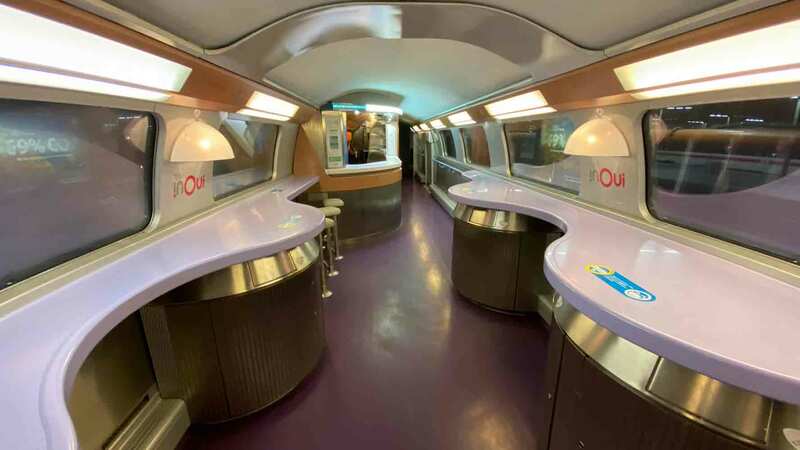 You can approach the sleeper or couchette attendant to ask if there are any beds free, there almost always will be, €12 should cover a couchette supplement in a 4-berth compartment. 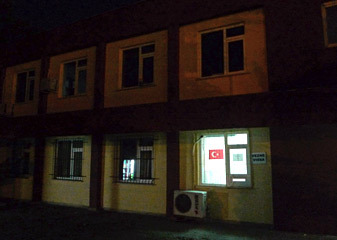 Be prepared to get off the train at the Turkish border at Kapikule late at night to buy a tourist visa and get your passport stamped, the train arrives at Kapikule 02:25 Turkish time and leaves again at 02:52. 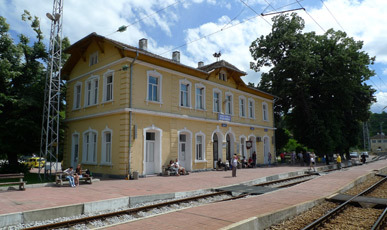 Step 3, you arrive at Halkali, a suburban station 25km west of Istanbul, on day 5. TCDD (Turkish Railways) run a transfer bus from Halkali to Istanbul Sirkeci in connection with this train, leaving Halkali soon after the train arrives and arriving Istanbul Sirkeci around 08:00. Rail tickets and passes are valid on this bus. If you prefer to go direct to your hotel by taxi, it will cost around 60 YTL (€16) but have Turkish lira with you as there is no ATM at Halkali. Alternatively, from 13 March 2019 the new Marmaray suburban train service started running from Halkali to Istanbul Sirkeci in the city centre (the new underground Marmaray platforms, not the historic station above-ground), through the Bosphorus rail tunnel to Söğütlüçeşme (for high-speed trains to Ankara & Konya) and beyond. Trains run every 15 minutes, journey time Halkali-Sirkeci is 49 minutes, fare around TL 3.25 (€0.60). So you can now complete the journey to central Istanbul by rail. Step 1, take the TCDD (Turkish Railways) transfer bus from Istanbul Sirkeci station to Halkali, leaving Istanbul Sirkeci station at 20:00 and arriving Halkali (a suburban station some 25km west of central Istanbul) at 21:00. This is a special bus run to connect with the train, rail tickets and railpasses are valid on this bus. Buy food and drink in Istanbul as there are few or no facilities to do so at Halkali. Alternatively, as from 13 March 2019 you can travel from Istanbul Sirkeci station (the underground Marmaray platforms, not the old above-ground station) to Halkali by suburban train, this runs every 15 minutes, journey time 49 minutes, fare around TL 3.25 (€0.60). 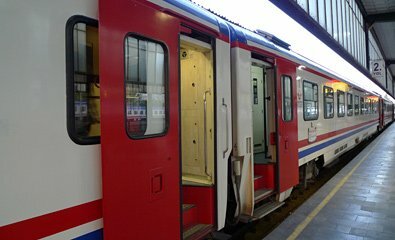 Step 2, travel from Istanbul Halkali to Bucharest by direct air-conditioned couchette car leaving Halkali at 21:40 and arriving Bucharest Gara de Nord at 18:54 next day. The train has a modern air-conditioned Turkish TVS2000 couchette car with 4 berth compartments. Be prepared to get off the train at the Turkish border at Kapikule late at night to get your passport stamped, you arrive Kapikule 01:31 and depart at 02:30. But you'll still get some sleep! Next day it's a lovely journey across Bulgaria, up the Shipka Pass and across the world's longest steel girder bridge over the Danube into Romania, 2.5km long. If you want to stop off at the ancient Bulgarian capital, Veliko Tarnovo for 24 hours, it's well worth a stop, the train calls there at 10:01. Bring your own supplies of food and beer as there's no catering car. Step 1, take the TCDD (Turkish Railways) transfer bus from Istanbul Sirkeci station to Halkali, leaving Istanbul Sirkeci station at 21:30 and arriving Halkali (a suburban station some 25km west of central Istanbul) at 22:30. If travelling 1 to 5 June 2019, check times when you buy tickets. This is a special bus run to connect with the train, rail tickets and railpasses are valid. Alternatively you can make your own way from downtown Istanbul to Halkali, a taxi should take an hour and cost around 60 YTL (€16). Buy food and drink in Istanbul as there are few or no facilities to do so at Halkali. Step 2, travel from Istanbul to Dimitrovgrad in Bulgaria on the Istanbul-Sofia Express, leaving Istanbul Halkali station at 22:40 every night and arriving Dimitrovgrad at 04:51. 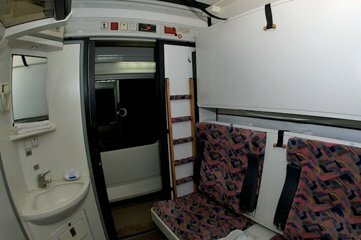 This train has comfortable Turkish TVS2000 air-conditioned sleeping-cars with 1 & 2 bed compartments and a Turkish TVS2000 air-conditioned couchette car with 4-berth compartments, see the photos below. Be prepared to get off the train at the Turkish border at Kapikule late at night to get your passport stamped, you arrive Kapikule 02:37 and depart at 03:15. Step 3, travel from Dimitrovgrad to Bucharest on a series of connecting trains, leaving Dimitrovgrad at 05:55, changing at Gorna Orjahovitsa (arrive 10:25, depart 12:55) & Ruse (arrive 15:15, depart 16:10) and arriving Bucharest Gara de Nord at 18:54. Bring your own supplies of food and beer as there's no catering car. 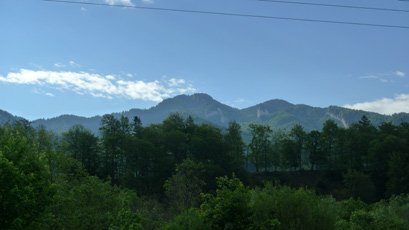 But it's a lovely journey meandering through the lush green valleys of Bulgaria, including an ascent of the Shipka Pass. You crosses the Danube from Ruse in Bulgaria to Giurgiu in Romania over the world's longest steel girder bridge, 2.5km long. Day 2: Spend the night & following day in Bucharest. The Hotel Ibis Gara de Nord is walking distance from the station, inexpensive and gets reasonable reports. Search for other hotels in Bucharest. Changes to train times over the last few years mean that a same-day connection is no longer possible, even if the Bosfor arrives on time, which it won't. The traditional 3-night journey has become 4 nights, but this does give you a stopover in the interesting city of Bucharest. Day 3: Travel from Bucharest to Budapest on the sleeper train Ister, leaving Bucharest Gara de Nord at 17:45 and arriving at Budapest Keleti station at 08:50 the next day (Day 4). 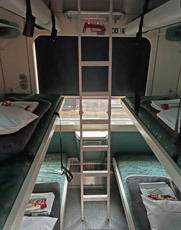 The Ister has a modern Romanian air-conditioned sleeping-car with safe, comfortable & carpeted 1, 2 & 3-bed compartments with washbasin, plus several deluxe compartments with 1, 2 or 3 beds and private shower & toilet. 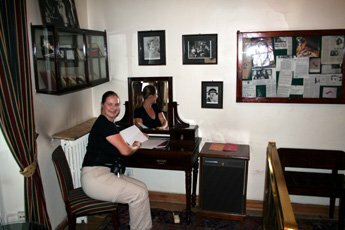 This is the recommended option, the rooms can be converted to private sitting rooms by day and there's even a shower at the end of the corridor which might work if you're lucky. 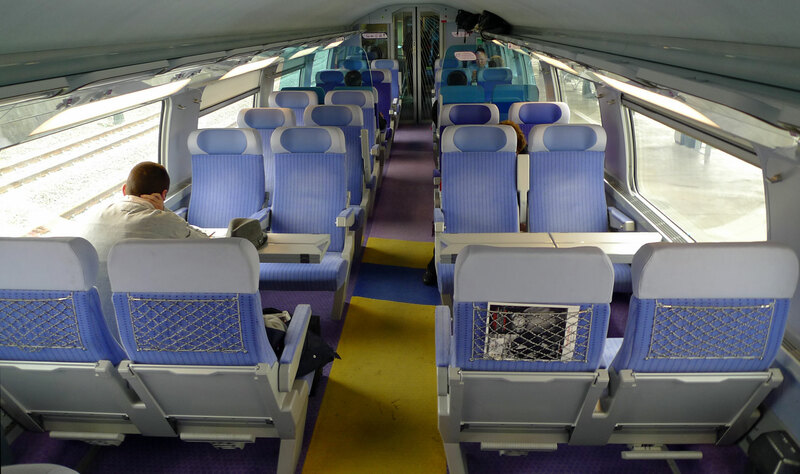 There are also ordinary seats (not recommended) and 4-berth & 6-berth couchettes (basic bunks with rug and pillow). The Ister also has a bar-bistro car for dinner. Day 4: You now have a choice. Option 1, spend a whole day exploring Budapest, left luggage is available at the station. Map of Budapest showing Keleti station. Then travel from Budapest to Munich overnight on the EuroNight sleeper train Kalman Imre, leaving Budapest Keleti at 20:40 and arriving at Munich Hbf at 06:10 next morning. The Kalman Imre has a comfortable air-conditioned Hungarian sleeping-car (1, 2 & 3 bed compartments with washbasin), couchettes (4 & 6 berth compartments) and seats (not recommended). If you have a first class ticket, you can use the business lounge in Budapest on platform 9, open 06:00-21:30 daily open for anyone with a 1st class international ticket to, from or via Budapest. Option 2, travel from Budapest to Munich by smart Austrian railjet train. There's one at 11:40 arriving 18:31, and another at 13:40 arriving 20:32. Stay overnight in a hotel in Munich, the Sofitel Munich Beyerpost, Eden Hotel Wolff, InterCity Hotel or (budget) the Pension Locarno are all right next to the station with great reviews. Day 5: Travel from Munich to Stuttgart, leaving Munich Hbf by ICE train at 07:28 arriving Stuttgart Hbf at 09:45. Day 5: Travel from Stuttgart to Paris by 200 mph double-decker TGV Duplex, leaving Stuttgart Hbf at 10:54 and arriving Paris Gare de l'Est at 14:19. In Paris, it's a 10-minute walk from the Gare de l'Est to the Gare du Nord. Day 5: Travel from Paris to London by Eurostar, leaving Paris Gare du Nord at 16:07, arriving London St Pancras at 17:39. Alternatively, if you choose to stay overnight in Munich and don't mind the early start, there's a direct TGV Duplex to Paris which leaves Munich Hbf at 06:46 (06:23 on Sundays), which will get you back to London St Pancras at 16:39. Of course. The train times shown above assume you are travelling straight through without stopovers, but as each train is ticketed separately and runs daily, you can book each leg of the journey for whatever date you want. So feel free to spend some time in Paris, Munich, Vienna, Budapest, Sighisoara or Brasov (for Dracula's castle) in Transylvania, Bucharest or Veliko Tarnovo (Bulgaria's ancient capital) on the way, it makes little or no difference to the cost. Just remember that most of these trains are 'reservation compulsory', so you need to have made a seat, couchette or sleeper reservation before you board each train, you can't just hop on without a reservation. You make all the reservations in advance in the UK, or you can stay flexible and make reservations at station ticket offices as you go along, it's up to you. If you choose to make reservations as you go, you will hardly ever find any of these trains fully booked, places are normally available even on the day of travel. There is only one daily train from Bucharest to Istanbul, but on most of the other stages (for example, London-Paris, Paris-Munich, Munich-Vienna, Vienna-Budapest & Budapest-Bucharest) there are other trains as well as the ones suggested above. You can check train times for each stage using www.bahn.de, although bear in mind that its timetable data is not 100% reliable for trains east of Bucharest. Sit back with a glass of red and enjoy the ride - book an upper deck seat for the best views. The train has power sockets for laptops & mobiles at all seats in both classes, and a cafe-bar serves drinks, snacks & microwaved hot dishes. The train soon leaves the Paris suburbs behind and speeds across a vast wide open plateau of woods and farmland at up to 200mph, past picturesque French villages of the Champagne region. After an hour or two, the train leaves the high-speed line and slowly meanders through pretty wooded hills, the countryside eventually flattening out towards Strasbourg. On leaving Strasbourg, look out for Strasbourg cathedral on the left with its famously missing second tower. Minutes afterwards you rumble across the river Rhine into Germany, before heading on to Stuttgart and Munich. Cosy & inviting, this is the modern air-conditioned Hungarian sleeping-car of the Kalman Imre at Munich Hauptbahnhof... 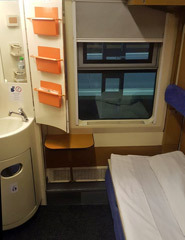 The sleeping-car has 10 compartments with washbasin, each of which can be used as a 1, 2 or 3 berth room, with toilets at the end of the corridor. The fare includes a light breakfast of coffee, juice & croissant. Watch the Hungarian sleeping-car video. There's time for dinner in Munich before boarding, for a Bavarian meal & a beer or two try www.augustinerkeller.de at Arnulfstrasse 52, to the north side of Munich Hbf. 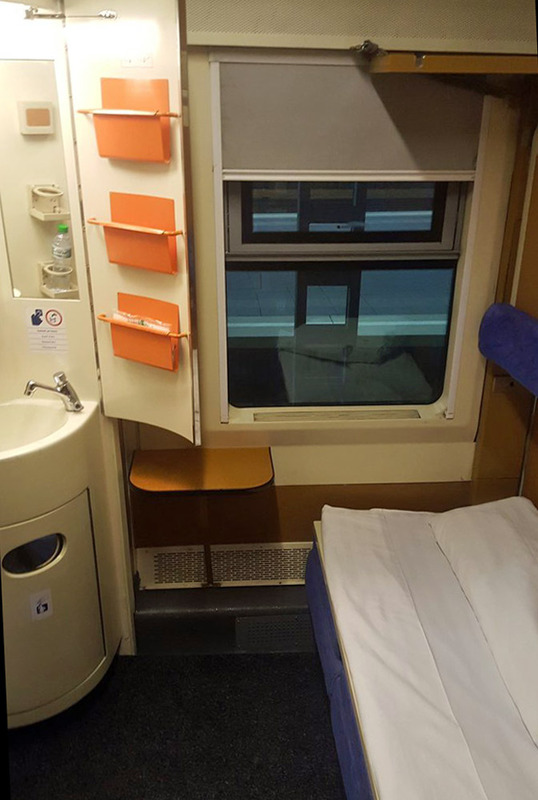 The Ister from Budapest to Bucharest has a modern air-conditioned Romanian sleeping-car with carpeted 1, 2 or 3-berth compartments with proper beds & washbasin, plus several deluxe 1, 2 or 3 bed compartments with private toilet & shower, see the photos below. Travelling in the sleeping-car is safe, comfortable & civilised. The Ister also has a Romanian couchette car with 6-berth & 4-berth compartments, each berth with rug, sheet & pillow, berths converting to seats by day. Couchettes are fairly basic, and a proper bed in the sleeper is much more comfortable and secure yet costs very little extra, so is the recommended option. There's a Romanian bar-bistro car attached in Romania serving a cooked breakfast eastbound and dinner westbound, but taking some supplies of your own is always a good idea. The Ister also has air-conditioned seats cars, but a mere seat is not recommended. Traveller Philip Dyer-Perry reports: "Budapest to Bucharest on the Ister is an absolute pleasure. I booked online with MAV and travelled in the new sleeping car, which was comfortable, smooth, and clean. There is a shower, but obviously not intended for use as most of the hose assembly was missing. There was a dining car, and if you ask you can get a menu, but it's better to ask the man what he's got and negotiate a price. If you have hard (non-Romanian) currency there is a certain amount of flexibility. In the evening it was chicken & potatoes, next morning it was a rather tasty omelette. 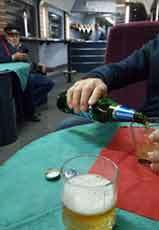 Just be aware that the main purpose of the dining car is as a place for the traincrew to smoke! It's good though, and a world away from Western Europe. 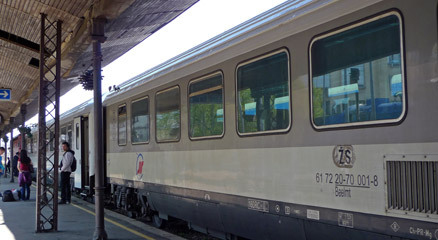 The Ister was around 20 minutes late on arrival in Bucharest, but the sleeping car attendant assured a fellow traveller that he would make the connection to Istanbul. In fact he even phoned his colleague on that train. Once we pulled in we both ran, he to the Istanbul car, me to the Sofia portion, and we made it..."
The sleeping-car (vagon de dormit) of the Ister at Budapest Keleti. Sleepers convert from beds to private sitting rooms for day use. The vagon cuseta (couchette car) on the Ister, at Budapest. Always book a couchette, not just a seat. Couchettes convert from bunks at night to seats for day use. 4 or 6-berth couchettes. Larger photo. Enjoy breakfast in the bar-bistro eastbound, or an evening beer westbound. The bar-bistro is attached between Simeria & Bucharest. Bar-bistro photos courtesy of Philip Dyer-Perry. In summer between June & September, a modern air-conditioned Turkish couchette car with 4-berth compartments operates direct from Bucharest to Istanbul Halkali. There was supposed to be a Romanian sleeping-car with 1, 2 & 3 bed compartments as well, but the Romanians discontinued this in August 2017. Photos below courtesy of Doc7Austin. 4-berth couchettes: As well as the Romanian sleeping-car the Bosfor has a modern air-conditioned Turkish couchette car like this. The seats convert to flat bunks with rug, sheet and pillow, 4 berths per compartment. ...or Dimitrovgrad to Istanbul by Sofia-Istanbul Express (September-June). In winter from September until June you take a series of connecting daytime trains from Bucharest to Dimitrovgrad, where you join the new Sofia-Istanbul Express from Dimitrovgrad to Istanbul Halkali. This has an air-conditioned Turkish sleeping-car with 1 & 2 bed compartments (there's even a shower at the end of the corridor! ), an air-conditioned Turkish couchette car with 4-berth compartments, and a Bulgarian couchette car (non-air-con) with 6-berth compartments. 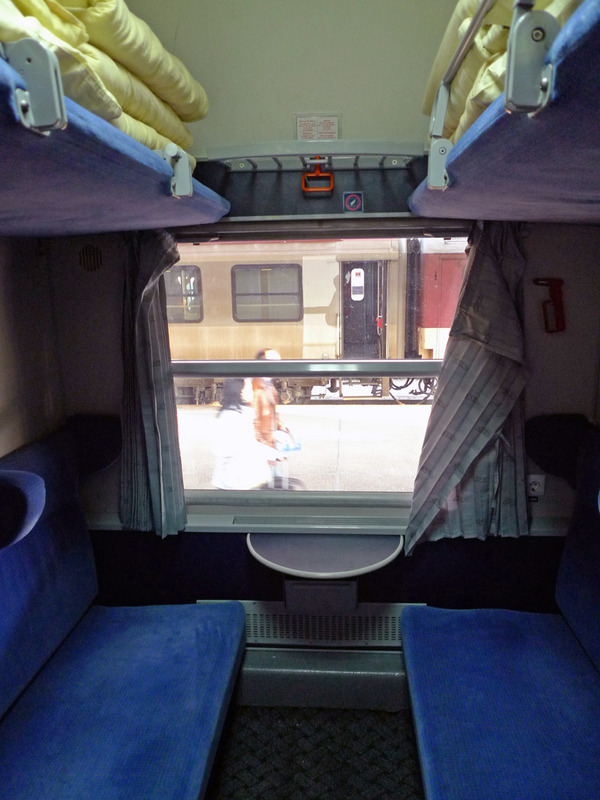 1 & 2 bed sleepers: Above right, an air-conditioned Turkish TVS2000 sleeping-car as used on the Sofia-Istanbul Express. Comfortable, carpeted, with compartments bookable as singles or doubles. Above right, a sleeper compartment shown with beds folded away and seats folded out. The journey from Bucharest to Istanbul is a pleasant, leisurely and enjoyable journey. A few hours after leaving Bucharest the train calls at the Romanian border point, Giurgiu, then crosses the Danube into Bulgaria on a 2.5 km long steel bridge, the longest steel bridge in Europe, built in 1954 and now fitted with a road deck above the railway. The Bosfor now spends a lazy afternoon meandering along pleasant river valleys across rural Bulgaria. Relax in your private sleeper, pour yourself a beer or glass of wine (remember to bring your own food & drink), read away the hours & enjoy the trip. After a late-night passport check at the Bulgarian border at Svilengrad, the train reaches the Turkish frontier at Kapikule well after midnight, around 01:25. 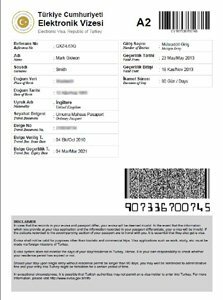 Here you will need to leave the train briefly to get your passport stamped, and if you haven't already bought a Turkish e-visa you'll need to buy a visa from the visa office first, see the visa information below. The train used to make a dramatic entry into Istanbul, passing through the Byzantine Walls of Theodosius and skirting the Sea of Marmara underneath the very walls of the Topkapi Palace, but as you can see above, you are currently taken the last few traffic-choked miles by bus due to engineering work on the line. 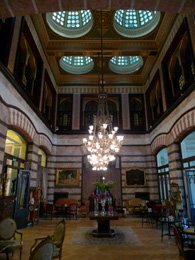 However, you still arrive at Istanbul's historic Sirkeci station built in 1888 in the heart of the city, walking distance from all the sights, where you can hop into a taxi to the famous Pera Palas Hotel. Expect an arrival an hour or two late, so allow for this and enjoy the ride... Map of Istanbul showing Sirkeci station. Across Romania... Brasov station in Transylvania. The free transfer bus from Halkali to Istanbul, arrived outside Istanbul Sirkeci station. Journey time about 50 minutes. Courtesy of Philip Dyer-Perry. There are two different ways to ticket a London to Istanbul train journey, (a) buying normal point-to-point tickets for each stage, or (b) using an InterRail pass. Point-to-point tickets are the cheapest option, assuming you book cheap advance-purchase tickets and buy each tickets from the cheapest source several months ahead, and find the cheapest prices available. These cheap tickets commit you to the specific train you book for each stage, limited or no refunds or changes allowed. It can be worth paying a bit more to use a pass because of the extra flexibility it offers. With a pass you can make side trips or change your itinerary or route on the hoof. With a pass you can simply reschedule or re-route if fire, flood, or missed connections affect your journey, but with cheap train-specific tickets you must stick to the booked trains and may have to buy new onward tickets if you miss a connection. If you live outside Europe, you qualify for a Eurail pass rather than InterRail, but you should find pricing and reservations work in exactly the same way as explained below. Calculating the cost of a London to Istanbul train journey is something of a black art. You're not buying a London to Istanbul ticket, as there's no such thing, you're buying a separate ticket for each train you take right across Europe. The price for each ticket varies depending on where you buy it and how far in advance you book. So get a calculator and add up the fare for your chosen class or type of sleeper or couchette for each leg of the journey. Fares for the Eurostar, TGV, Kalman Imre & Railjet work like air fares, varying depending on how popular that date & train is and how far ahead you book. Budapest to Bucharest also has some limited-availability offers if you book online direct with Hungarian Railways. From Bucharest to Istanbul, the price shown below is fixed and is what you pay whenever you book, even if you bought at the station on the day. From €69 each way in 1st class. The price varies, book in advance to get these fares, full-price €139. If you book at www.bahn.de, accompanied children under 15 go free. Flex price = fully flexible, refundable, buy any time. Economy class fares from €39.90 each way. First class fares start at €69.90 each way. All per person, berths sold individually, you don't need to fill the whole compartment. £87 each way in 6-berth couchettes. £95 each way in 4-berth couchettes. £162 each way in 2-bed deluxe sleeper with shower, £209 in single-bed deluxe. €37.20 for a ticket + €14 supplement for a couchette in 4-berth compartment. The train is priced in euros, but you will be charged in Turkish Lira or Bulgarian Lei. £76 each way in 4-berth couchettes. 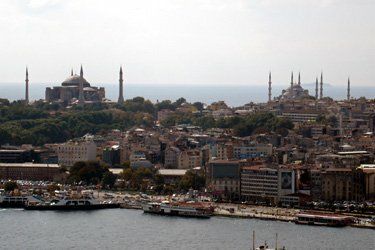 For a one-way trip to Istanbul, a 5-days-in-1 month flexi InterRail pass gives a 5 days of unlimited 2nd class train travel in all the countries you pass through within a maximum overall period of 1 month, which is plenty to make the journey, even with a day or two in Vienna and Budapest and Bucharest if you want. It costs £196 if you are under 28 years old, £255 if you're 28-59, or £230 if you're over 60. Children 4-11 inclusive get a free £0 InterRail pass if accompanied by an adult. For a return trip to Istanbul, a 10-days-in-2-months pass costs £278 if you are aged under 28, £362 if you're aged 28-59, or £326 if you're over 60. Children 4-11 inclusive get a free pass if accompanied by an adult. This gives a total of 10 days of unlimited 2nd class train travel in all the countries you pass through within an overall period of 2 months, which is enough to make the outward and return journeys, even with a day or two in Vienna and Budapest or Bucharest if you want, as long as you complete both your outward and return journeys within the 2 month period covered by the pass. It's not usually worth bothering with a 1st class pass, as only a 2nd class pass is needed for most sleepers & couchettes on the Munich-Budapest & Budapest-Bucharest trains, and the Balkan trains are often 2nd class only, so a 1st class pass would cost a lot more but only make any difference on the London-Paris-Munich sectors. 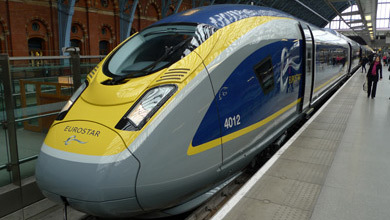 2) A Eurostar passholder fare from London to Paris... InterRail passes now cover Eurostar, but you still need to pay a Eurostar passholder fare of €30 in standard class if you have a 2nd class pass or €38 in standard premier if you have a 1st class pass. See the Eurostar page for full details of this passholder fare and how to buy it. 3) The Paris-Munich TGV reservation fee... This is around €10 one-way in 2nd class. 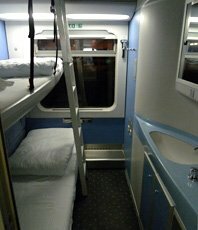 4) The Munich to Budapest sleeper reservation... Passholders pay the following supplements for the Munich-Budapest sleeper train, per person per bed: Couchette in 6-berth compartment €20, couchette in a 4-berth compartment €25, bed in a 2-berth sleeper €50, bed in a single-berth sleeper €100. Information from www.bahn.de. Seat reservation is optional on the Railjet train from Munich to Budapest, there's no passholder supplement or fee to pay, so Just board the train with your pass and sit in any unreserved seat, this is not a problem. 5) The Budapest to Bucharest sleeper or couchette reservation... Couchette in 6-berth €15, couchette in 4-berth €22, bed in 3-bed sleeper €28, bed in 2-bed sleeper €42. Bed in single-bed sleeper (1st class ticket or pass required) €98. Information from www.cfrcalatori.ro. 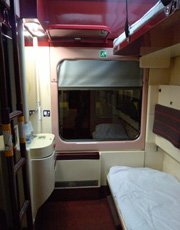 6) The Bucharest to Istanbul couchette reservation... Couchette in 4-berth €14. Information from www.cfrcalatori.ro. Remember the new rule for using InterRail flexi passes on overnight trains: As from 2019, overnight trains only require one day of a flexi pass to be dated, the date it leaves, as long as you don't change trains after midnight. See the more detailed explanation here. How to book a London-Istanbul journey using an InterRail pass. More information about InterRail passes & how they work. Step 1, plan your trip. Decide which type of InterRail pass you need, by reading the information about InterRail passes above and on the InterRail page. Decide which route you want to use, and make a list of which train reservations you want on which specific dates. This may help: How to plan an itinerary & budget. Step 2, buy the InterRail pass... You can buy online from www.myinterrail.co.uk (UK residents only), or www.interrail.eu (any European resident), I recommend comparing prices as sometimes one is slightly cheaper than the other. Step 3, buy your Eurostar ticket at the special passholder rate as shown in the Eurostar passholder information section. You can make the Munich-Budapest sleeper reservation at www.bahn.de. Act as if buying a ticket, when you select the direct EuroNight (EN) train with 0 changes and see prices, look for the little black link at the bottom of the price table which says Book supplement only. On a good day you can make the Paris-Munich TGV reservation and possibly the Budapest-Bucharest couchette or sleeper train reservation online at en.oui.sncf/en/pass/seat-reservation. Book from Paris to Munich selecting a 15:00 departure time. But engage brain, if you see anything costing over €30 per person that's it's a regular fare not a passholder reservation. Do the same again for Budapest to Bucharest. Note that if you want a single or 2-berth sleeper on the Budapest-Bucharest train you'll need to pick up the phone. You cannot book the Bucharest-Istanbul journey, only by phone (when the direct train is running) or at the stations as you go (when the direct train is not running). If you have problems pick up the phone! Step 5, otherwise, make your reservations by phone, from DB's UK telesales line on 08718 80 80 66, lines open 09:00-20:00 Monday-Friday, 09:00-13:00 Saturday & Sunday, no booking fee, 2% credit card charge, or International Rail on 0844 248 248 3, lines open 09:00-17:00 Monday-Friday, overseas callers +44 844 2482483. You can buy tickets online for the London-Bucharest part of the journey in either direction, and this is the cheapest way to book because you can see all the cheap deals direct from the train operators and don't pay any booking fees. However, you'll still need to book the Bucharest-Istanbul train by phone because this cannot be booked online. Booking usually opens 92 days ahead for most trains, but 120 days ahead for Eurostar and 60 days ahead for Budapest-Bucharest. However, I strongly recommend waiting until 92 days so you can buy most tickets together, doing a dry run on all websites first to check times and prices before booking for real. 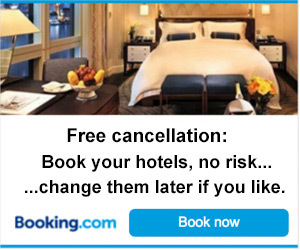 Hotel accommodation can be booked before booking your trains risk-free if you use a site such as www.booking.com with free cancellation. Before you start, I recommend making a list of the specific trains and dates you want to book, as each train is effectively a separate booking. Go to www.eurostar.com & book your Eurostar tickets between London and Paris. Use the Eurostar times above as a guide, but by all means book an earlier Eurostar outwards, or a later Eurostar on the way back, if this has cheaper seats available of if you'd like to stop off in Paris for a while. You print out your own ticket. If you don't live in London, see the advice on buying connecting tickets from other UK towns & cities here. 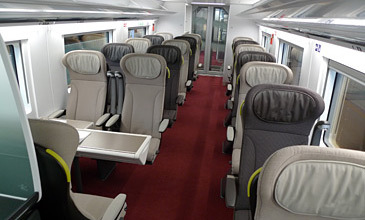 If you want to choose your exact seat on Eurostar, book & pay at www.eurostar.com then use the 'Manage a booking' link on their home page which allows you to choose an exact seat from a numbered seating plan. 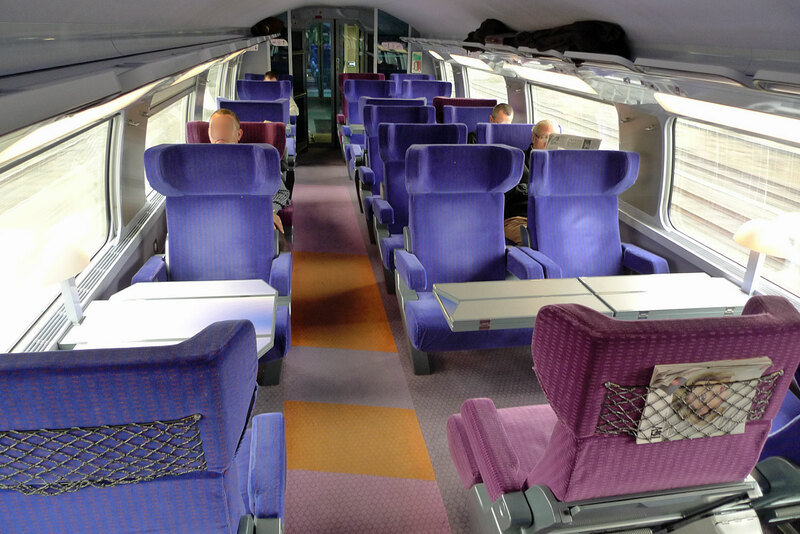 See tips on choosing the best seats on Eurostar. Use either www.loco2.com or the German Railways website www.bahn.de, by all means check both sites. If you use bahn.de, I recommend registering when prompted so you can easily retrieve your bookings and re-print tickets at any time. Use either www.bahn.de or www.trainline.eu for this, indeed prices can be cheaper on one than the other. Use the journey planner to bring up the Munich-Budapest sleeper train marked EN with 0 changes. 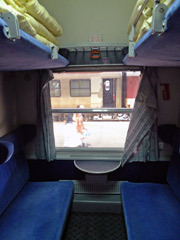 It will show if any cheap special fares are available in each type of couchette and sleeper. You print out your own ticket. If you want to take the railjet option rather than the sleeper between Munich and Budapest, you also book this at www.bahn.de or www.trainline.eu. If you want to stop off in Vienna for (say) a day, use www.bahn.de, click Add intermediate stops and and enter Vienna in the via box and 24:00 in the 'hh:mm stopover' box. It'll then book you a 24 hour stopover in Vienna, but still let you buy a cheap €39 fare from Munich to Budapest if it's available. 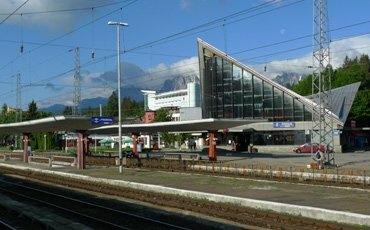 You can even spend a few hours in Salzburg on the way as well, by entering Salzburg in the via box and (say) 04:00 in the stopover box, then adding another stopover and entering Vienna & 24:00. All still from €39.90! For one-way or round trip tickets starting in Budapest, buy a cheap advance-purchase fare at the Hungarian Railways website www.mav-start.hu. Before jumping in, read my tips & advice for using mav-start.hu and how your tickets are collected. For Bucharest you need to use 'Bucuresti'. For one-way or round trip tickets starting in Bucharest, buy a cheap advance-purchase fare at the Romanian Railways website bileteinternationale.cfrcalatori.ro. Click EN top right for English. Bucharest is listed as Bucuresti (Romania). Tickets must be collected from a Romanian ticket office such as Bucharest Nord. When the through couchette car runs you should be able to buy tickets online at the Romanian Railways website bileteinternationale.cfrcalatori.ro. Click EN top right for English. For Bucharest enter/select Bucuresti (Romania) and for Istanbul enter/select Halkali (Turkey). Tickets must be collected from a CFR station ticket office in Romania such as Bucharest Nord, so only use this site for one-way or round trip journeys starting in Romania. Feedback would be appreciated. Alternatively, tickets can be arranged by agency Paralela 45 Turism, www.paralela45.com. They can source train tickets starting in Bucharest, so far recommended by several seat61 correspondents. Feedback would be appreciated. Or you can buy a ticket at the station in Bucharest, the direct couchette car usually always has sleeping berths available even on the day. For international tickets go to ticket window 1 in a room marked Case de Bilete with a large blue sign, not far from the information kiosk in the centre of the station, see photos of this ticket office so you know what to look for. In the westbound direction, you can buy tickets for this direct couchette car at the international ticket window at Istanbul Sirkeci station. Go to the Romanian Railways website bileteinternationale.cfrcalatori.ro and click EN top right for English. It won't book all the way to Istanbul when there's no direct train, so first try booking from Bucharest to Dimitrovgrad. Bucharest is listed as Bucuresti (Romania). When I've tried booking to Dimitrovgrad it shows times but produces an error message when I try to buy a ticket, so plan B is to book from Bucharest to Gorna Orjahovitsa, which should work. You've plenty of time when you arrive in Gorna to buy an onward ticket to Dimitrovgrad at the station (or even to Istanbul Halkali if they can sell it, feedback appreciated). At Dimitrovgrad you'll need to approach the sleeper or couchette attendant to pay for a free berth and if necessary buy a Dimitrovgrad to Istanbul ticket on board. Don't worry, there are almost always places available even on the day. In the westbound direction, you can buy tickets from Istanbul to Dimitrovgrad at the international ticket window at Istanbul Sirkeci station. 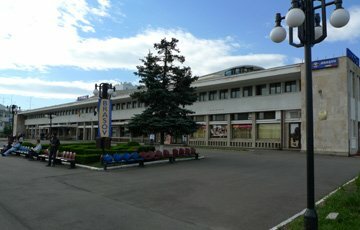 You'll then need to buy a ticket from Dimitrovgrad to Ruse at the station when you get to Dimitrovgrad, or if necessary just pay on the train. Then buy a ticket from Ruse to Bucharest at the station when you get to Ruse. This is no problem, there are always places available. International Rail on 0844 248 248 3, lines open 09:00-17:00 Monday-Friday. Overseas callers call +44 844 2482483. Unlike some other agencies, International Rail are equipped with the French, German & Italian rail ticketing systems, so can sell the cheapest fares for all these trains from the UK to Italy and within Italy. They charge a £10 booking fee for bookings under £100, £20 for £100-£300, £30 above £300. Deutsche Bahn's UK line on 08718 80 80 66, lines open 09:00-20:00 Monday-Friday, 09:00-13:00 Saturday & Sunday. They don't charge a booking fee, just a 2% credit card fee. Tickets can be sent to UK or Irish addresses, or (for a fee) overseas addresses. Just be aware that their staff aren't always familiar with complex bookings like this and may need gentle persuasion. You will need to talk them through exactly what train bookings you want, and be polite but persistent if necessary. If you like, you can stay flexible and buy tickets as you go. However, I'd strongly recommend buying the Eurostar ticket well in advance at www.eurostar.com because prices rise steeply as departure date approaches, like air fares. 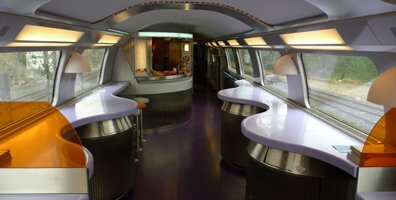 I'd also suggest pre-booking the Paris-Munich TGV, using either www.loco2.com or www.bahn.de (check prices on both!) as there are also cheap deals if you pre-book. The Munich-Budapest railjet train doesn't require a reservation and there are always places available, but again it might cost just €39 if you book in advance, but three times this if you leave it until the day of travel. From Budapest to Bucharest and from Bucharest to Istanbul, buying at the station can actually be cheaper than pre-booking from the UK, as (a) the price is the same whether you buy in advance or buy on the day, and (b) the station in Budapest can sell you a ticket for these journeys using cheaper local tariffs, whereas UK agencies can only sell tickets using the standard international tariff. There are almost always places in the sleeping car available, even on the day of travel, although of course nothing is 101% certain if you leave it till the day of departure, so buying as you go is probably a good option only if you have plenty of time and/or are planning to stopover en route anyway. Remember that in the off-season, you may have to buy a Bucharest-Ruse ticket at Bucharest, a Ruse-Dimitrovgrad ticket at Ruse (or on the train) and a Dimitrovgrad-Istanbul ticket on board the train. If putting the trip together yourself seems too daunting (even with advice I provide! ), one experienced company offers a compete custom-made travel service with all your rail tickets expertly booked for you and good quality hotels arranged at stops along the way. You simply tell them where you want to go and where you'd like to stop off on the way, and they will do the rest. Railbookers get very positive reviews, and they look after their customers very well. One or two other companies offer this service too, see the details here. Go to Istanbul's Sirkeci station, ticket window 4. They can sell tickets to Bucharest or Sofia. You can find the cost of tickets from Istanbul to these cities at www.tcddtasimacilik.gov.tr (click English top right, click PASSENGER then Trains then International trains). However, they can't sell tickets or make reservations beyond Bucharest or Sofia because they have no reservation computer linked to the reservation system for the rest of Europe. Note that in the off-season when there's no direct couchette car from Istanbul to Bucharest, you'll need to by a couchette or sleeper ticket from Istanbul to Dimitrovgrad and rebook there (or pay on the train if there isn't time) to Ruse, then rebook again in Ruse for the train to Bucharest. So buy a ticket from Istanbul to Sofia or Bucharest, you can buy a Sofia-Belgrade-Budapest or Bucharest-Budapest ticket when you get there. Then go to an internet cafe, check they have a printer, and book the sleeper train from Budapest to Munich and the TGV from Munich to Paris online at www.bahn.de, with cheap fares available if you book in advance. You can buy a Eurostar ticket from Paris or Brussels to London online at www.eurostar.com. If you simply turn up in Budapest or Munich, you can of course book these trains on the day if there are spaces available (and there usually will be), but you'll pay the full fare, no cheap deals available at the station on the day of travel. Eurostar can also be booked on the day at the station in Paris or Brussels if all else fails, but you'll pay a much more expensive price than if you-pre book in advance online. The Haghia Sofia (left) & Blue Mosque (right) seen from the top of the Galata Tower. The equally famous Topkapi Palace is just out of shot to the left. UK citizens don't need a visa for Hungary, Romania, Serbia or Bulgaria, but they need a tourist visa to enter Turkey. You can buy your Turkish visa in advance online, or buy it at the Turkish border at Kapikule. Either way, Kapikule is one of the only borders in Europe where passport control is not done on board the train, you have to get off and go to the office marked 'Passports' on the platform. The eastbound train from Sofia & Bucharest arrives at Kapikule at around 01:50 and leaves again at 02:56, so there's plenty of time for this, but don't worry, you'll soon be back in bed. Option 1, buy a Turkish e-visa in advance online - the recommended option. Turkey introduced an e-visa system in April 2013, and getting an e-visa is likely to become compulsory at some point in the future. If you plan to visit Turkey you can easily buy an e-visa online and print it out for $20 at www.evisa.gov.tr. It's very simple to use, you can print your e-visa within seconds of applying. You'll still need get get off the train at Kapikule (remembering not to leave any valuables in your compartment, but you can leave your larger bags), and follow everyone into the office marked 'Passports' on the platform to have your passport stamped. Then you can get back on the train. Your passport will then be checked again on board the train before the train leaves. If you have an e-visa, there's no need to go to the visa office first to buy a visa as you used to. Option 2, buy a visa at the Turkish border: Until further notice, it's still possible to buy a visa at the border if you prefer, although please check as the Turkish government plans to phase out this option and make e-visas compulsory at some point in the future. You must take cash in pounds sterling or euros with you for the visa, in 2015 the visa costs £20, payable in pounds sterling or euros (Scottish banknotes not accepted). On arrival at Kapikule, leave the train with everyone else (remembering not to leave any valuables in your compartment), but don't blindly follow the other passengers into the passport office, because you will be turned away when you get to the front of the queue if you don't have a visa. You must buy your tourist visa first, by going to the visa office in the set-back building block towards the front of the train, marked 'Vezne Vissa' with a Turkish flag in the window, then go to the office marked 'Passports' (where by this time the queues should be very short or gone) to get your visa checked and passport stamped. The train stops at Kapikule for plenty of time for this to be done, so don't worry, it doesn't leave again until 02:56. Your passport will then be checked again on board the train before the train leaves. The traditional route from London or Paris to Istanbul is via Belgrade & Sofia rather than Bucharest, that's the way the Orient Express would have gone in the 1920s and 1930s. It's a fascinating & scenic ride, see video of the Belgrade-Sofia-Istanbul train journey. If you use the journey suggested below you'll find decent quality air-conditioned trains from London as far as Belgrade, and indeed an excellent Turkish air-conditioned sleeper train between Sofia and Istanbul, the weak point in this route is the Belgrade-Sofia train outside the summer period, as you can see from the journey details below. For variations to this route via Zurich or via Vienna & Budapest, see here. Travel tip: In Munich, there's time for dinner while waiting for the sleeper to Budapest, for local Bavarian food and a beer or two try www.augustinerkeller.de at Arnulfstrasse 52, to the north side of Munich Hbf. Day 1: Travel from Munich to Zagreb overnight on the sleeper train Lisinski, leaving Munich Hbf at 23:20 and arriving at Zagreb at 08:35 next morning (day 2). The Lisinski has a smart modern air-conditioned Croatian sleeping-car (1, 2 & 3 bed compartments with washbasin), a smart modern Croatian couchette car (4 & 6 berth compartments) and ordinary seats. Watch the Croatian sleeper video. Day 2: Travel from Zagreb to Belgrade by air-conditioned EuroCity train, leaving Zagreb at 11:03 and arriving Belgrade Centar station at 17:42. This train has modern air-conditioned Serbian carriages with comfortable 2nd class seats (no 1st class). There's no dining-car, so bring along a picnic and maybe some beer or wine. Stay the night in Belgrade. I highly recommend the famous Hotel Moskva at the start of Belgrade's main pedestrianised street. You have an evening to explore Belgrade & have dinner - see map of Belgrade showing station. Make sure you wander through Belgrade to the fortress at sunset, overlooking the confluence of the Danube and Sava rivers. When the direct train isn't running (until 13 June & from 17 September 2019), you travel from Belgrade to Sofia like this: Take the 06:10 from Belgrade Centar station, changing at Nis (arrive 10:49, depart 11:10) and Dimitrovgrad (arrive 14:45, depart 15:35) to arrive at Sofia at 19:00. See the Belgrade to Sofia page for more photos, tips & information. Stay the night in Sofia. In theory, if you arrive in Sofia at 20:12 you can leave on the night train to Istanbul at 21:15, but this is not a robust connection in this part of the world so it's better to build in a 24h stopover in Sofia. For a good inexpensive hotel 10 minutes walk from the station, I suggest the Hotel Favorit, www.hotelfavorit.bg. Spend the next day exploring Sofia. Of course, off-season when you arrive in Sofia at 18:50, a same-day connection with the 21:15 sleeper to Istanbul is a realistic option. 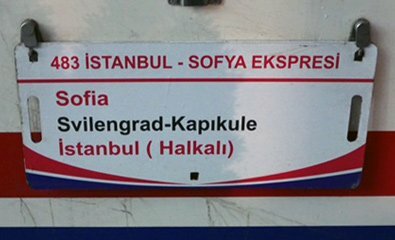 Day 4, travel from Sofia to Istanbul on the Sofia-Istanbul Express. From 1 June to 7 October 2019 it leaves Sofia central station at 21:30 and arrives Istanbul Halkali station at 07:40 next morning (day 5 from London). Outside this period from October to May it leaves Sofia central station at 21:10 and arrives Istanbul Halkali station at 06:49 next morning. The Sofia-Istanbul Express has two safe & comfortable Turkish air-conditioned sleeping-cars and one Turkish air-conditioned 4-berth couchette car. You cannot reserve this train from outside Bulgaria, but there are always places available on the day if you buy tickets at Sofia station. 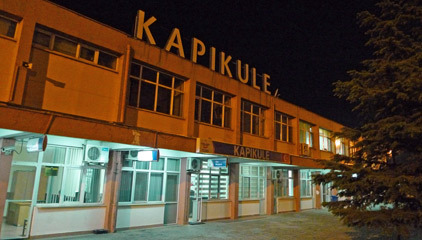 Be prepared to get off the train at the Turkish border at Kapikule late at night to buy a tourist visa and get your passport stamped, in summer you arrive Kapikule 03:10 and depart at 03:50. Halkali is a suburban station some 25km west of Istanbul Sirkeci station, the line from Halkali into Istanbul is still being reconstructed in connection with the Marmaray Project. TCDD (Turkish Railways) run a free transfer bus from Halkali to Istanbul Sirkeci in connection with this train, leaving soon after the train arrives. From 1 June to 7 October 2019 the bus will get you to Istanbul Sirkeci at 09:00. 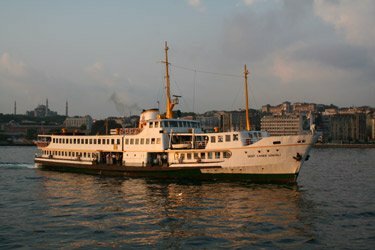 Until 31 May & from 8 October it will get you to Istanbul Sirkeci at 08:00. Rail tickets and passes are valid on this bus. Alternatively, a taxi from Halkali direct to your hotel in central Istanbul will cost around 60 YTL (€16), but have some Turkish currency with you as there is no ATM at Halkali. 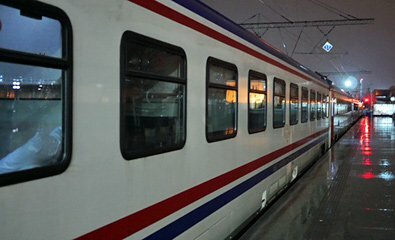 Update: From 13 March 2019 a suburban train service is now operating between Halkali, Istanbul Sirkeci in the city centre (the new underground Marmaray station, not the historic station above-ground), through the Bosphorus rail tunnel to Söğütlüçeşme (for high-speed trains to Ankara & Konya) and beyond. You can now complete the journey to central Istanbul by rail. Trains run every 15 minutes, journey time from Halkali to Sirkeci 49 minutes, fare around TL 3.25 (€0.60). 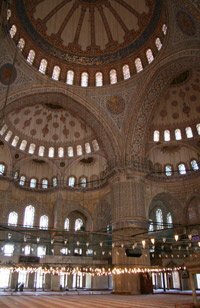 Day 1: Travel from Istanbul to Sofia on the daily Istanbul-Sofia Express. In the off-season until 31 May & from 8 October 2019 it leaves Istanbul Halkali station at 22:40 and arrives at Sofia central station at 08:38 next morning. From 1 June to 7 October 2019 it leaves Istanbul Halkali station at 21:40 and arrives at Sofia central station at 08:38 next morning (day 2). 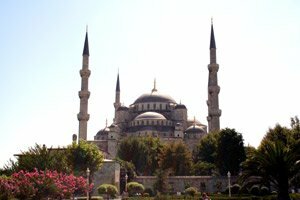 The Istanbul-Sofia Express has two safe & comfortable Turkish air-conditioned sleeping-cars, one Turkish air-con 4-berth couchette car. Be prepared to get off the train at the Turkish border at Kapikule late at night to have your passport stamped, in summer it arrives at Kapikule at 01:32 and leaves again at 02:30, in winter it arrives at Kapikule at 02:31 and leaves again at 03:15. If you get any interior or exterior photos of this train, please let me know! Halkali is a suburban station some 25km west of Istanbul Sirkeci station, as the line from Istanbul Sirkeci to Halkali is still being reconstructed in connection with the Marmaray Project. TCDD (Turkish Railways) run a transfer bus from Istanbul Sirkeci to Halkali in connection with this train. From 1 June to 7 October 2019 it leaves Istanbul Sirkeci station at 20:00, arriving Halkali about an hour later. In the off-season until 31 May & from 8 October 2019 it leaves Istanbul Sirkeci station at 21:30. Rail tickets and passes are valid on this bus. Alternatively you can make your own way from central Istanbul to Halkali by taxi, this should take 50 minutes & cost around 60 YTL (€16). Buy food & drink in Istanbul as there are few or no facilities at Halkali. The situation changes occasionally, so feedback would be appreciated! A same-day connection with the train to Belgrade is possible and in this direction usually works, but there may be delays so I'd build in a stopover at Sofia, as shown below. Day 2: Spend the day exploring Sofia and stay there overnight. Try the Hotel Favorit, 10 minutes walk from Sofia station, www.hotelfavorit.bg. A same-day connection is theoretically possible, arriving from Istanbul at 09:10 and departing for Belgrade at 09:40, but this is not a robust connection so it's better to build in a 24h stopover in Sofia. Day 3: Travel from Sofia to Belgrade on the Balkan. From 14 June to 16 September 2019, you leave Sofia central station at 09:30 and arrive Belgrade Topcider station at 18:18. This train is 2nd class only and has no catering car so bring your own picnic and supplies of wine or beer. In the off-season when the direct train isn't running, you travel from Sofia to Belgrade like this: Take the 09:30 from Sofia, change at Dimitrovgrad (arrive 10:30, depart 11:25) & Nis (arrive 14:44 depart 15:50) and arrive Belgrade Centar station at 21:04. Stay the night in Belgrade. I highly recommend the famous Hotel Moskva, 10 minutes walk from the station, at the start of Belgrade's main pedestrianised street, great for an evening wander. Day 4: Travel from Belgrade to Zagreb by air-conditioned EuroCity train, leaving Belgrade Centar station at 10:35 and arriving Zagreb at 18:12. This train has modern air-conditioned Serbian carriages with comfortable 2nd class seats (no 1st class). There's no dining-car, so bring along a picnic and some beer or wine. You've now time for dinner in Zagreb. 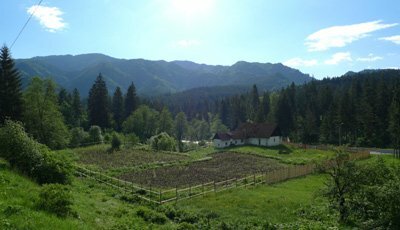 Day 4: Travel from Zagreb to Munich overnight on the sleeper train Lisinski, leaving Zagreb at 21:20 and arriving at Munich Hbf at 06:10 next morning. The Lisinski has a smart modern air-conditioned Croatian sleeping-car (1, 2 & 3 bed compartments with washbasin), a smart modern Croatian couchette car (4 & 6 berth compartments) and ordinary seats. Watch the Croatian sleeper video. Day 5: Travel from Munich to Stuttgart, leaving Munich Hbf by ICE train at 07:28 arriving Stuttgart at 09:45. Day 5: Travel from Stuttgart to Paris by 200 mph double-decker TGV Duplex, leaving Stuttgart at 10:54 and arriving Paris Gare de l'Est at 14:19. In Paris, it's a 10-minute walk from the Gare de l'Est to the Gare du Nord. Of course. Each train is ticketed separately, so it makes no difference to the cost if you want to spend some time in Paris, Munich, Zagreb, Belgrade or Sofia - although even travelling non-stop in 4 nights as shown above you get an evening in Belgrade and a whole day to explore Sofia. Just book each train for whatever dates you like. Point-to-point tickets or InterRail pass? There are two completely different ways to ticket a London to Istanbul journey, (a) buy normal point-to-point tickets, or (b) use an InterRail pass. If you are under 28 years old, the cheapest option is to use an InterRail pass as shown here. If you are over 28, point-to-point tickets are a fraction cheaper for a one-way trip, assuming you get the cheapest deals for each train, but even so, the extra flexibility of an InterRail pass can make the pass option worthwhile as you can make side trips or change your itinerary or route on the hoof. For a return journey, an InterRail pass is definitely the cheapest option assuming you will be spending less than 22 days away from home (giving you up to two weeks in Turkey), but if you plan to be away for more than 22 days, so cannot use a 10-days-in-22-days InterRail pass, point-to-point tickets are likely to be cheaper than two 5-day or one 1-month InterRail passes. If you live outside Europe, overseas visitors don't qualify for InterRail, they must buy the more expensive Eurail pass range instead, which makes point-to-point tickets the cheaper option. How much does it cost using point-to-point tickets? Each train is ticketed separately, so add up the price for each leg of the journey. At the western end, fares work like air fares, varying depending on how popular that date and train is, and how far ahead you book. From Zagreb onwards, prices are fixed, and the price shown below is what you pay whenever you book, even if you bought at the station on the day. From €69.90 each way in 1st class. Flex fare £81 one-way, £142 return. £43 each way if bought in the UK. €30 or so if bought at the station in Zagreb (recommended). £44 each way bought by phone in the UK. €20.60 bought at the station in Belgrade (recommended). €27.72 for a 1st class ticket + €35 supplement for a single-bed sleeper. How much does it cost using an InterRail pass? For a one-way trip to Istanbul, a 5-days-in-1 month flexi InterRail pass gives a 5 days of unlimited 2nd class train travel in all the countries you pass through within an overall period of 1 month starting any date you like, which is plenty to make the journey, even with a day or two in Vienna and Budapest and Bucharest. It costs £196 if you are under 28 years old, £255 if you're 28-59, or £230 if you're over 60. Children 4-11 inclusive get a free £0 InterRail pass if accompanied by an adult. It's not usually worth bothering with a 1st class pass, as only a 2nd class pass is needed for most sleepers & couchettes on the Munich-Zagreb train, and the Balkan trains are often 2nd class only, so a 1st class pass would cost a lot more but only make any difference on the London-Paris-Munich sectors. 2) A Eurostar passholder fare from London to Paris: InterRail passes now cover Eurostar as from 2017, but you still need to pay the Eurostar passholder fare of €30 in standard class if you have a 2nd class pass or €38 in standard premier if you have a 1st class pass. See the Eurostar page for full details of this passholder fare and how to buy it. 3) The Paris-Munich TGV reservation: With an InterRail pass, the passholder supplement for the Paris-Munich TGV is around €10. 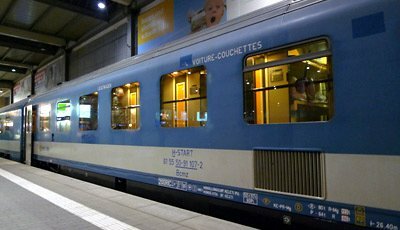 4) The Munich-Zagreb sleeper or couchette reservation: Expect a couchette in 6-berth to cost around €13, couchette in 4-berth €20, bed in 3-bed sleeper €22, bed in 2-bed sleeper €33. Bed in single-bed sleeper (1st class ticket or pass required) around €77. On the Zagreb-Belgrade & Belgrade-Sofia daytime trains, a seat reservation is optional. No fee to pay for passholders, just show your pass. 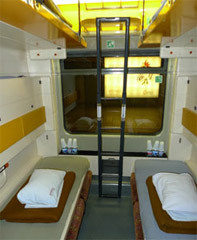 5) The Sofia to Istanbul couchette reservation: A couchette in a 6-berth compartment costs around €10. Step 1, plan your trip using the information above. This method is a good way to plan this trip: How to plan an itinerary & budget. Step 2, buy your InterRail pass... You can buy online from www.myinterrail.co.uk (UK residents only) or www.interrail.eu (any European resident), I recommend comparing prices as sometimes one is slightly cheaper than the other. Step 3, buy your Eurostar passholder fare as shown in the Eurostar passholder fare information section. Step 4, some reservations can be made online. 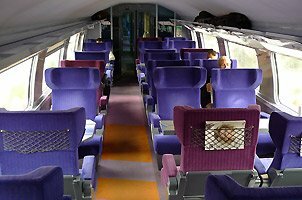 You can make the Paris-Munich TGV train reservation, and possibly the Munich-Zagreb sleeper train reservation & a Zagreb-Belgrade seat reservation online at en.oui.sncf/en/pass/seat-reservation. First click Rail Passes above the journey planner. Then select Reservation and close the pop-up box which appears. Now book from Paris to Munich selecting an afternoon departure time. Try the same again for Munich to Zagreb & Zagreb to Belgrade. Step 5, alternatively, you can make all these reservations by phone, from International Rail on 0844 248 248 3, lines open 09:00-17:00 Monday-Friday, overseas callers +44 844 2482483. Alternatively, try DB's UK telesales line on 08718 80 80 66, lines open 09:00-20:00 Monday-Friday, 09:00-13:00 Saturday & Sunday, no booking fee, 2% credit card charge. Step 6, you cannot book the Sofia-Istanbul train online anywhere, or even book it by phone outside Bulgaria, so simply book this train at the international ticket window at Sofia station when you reach Sofia. There are always places available, so don't worry. When I last travelled there were just 8 of us in a 60-berth couchette car. Step 1, book from London to Munich at www.loco2.com and print your own tickets. Tip: If you'd like a longer connection in Paris, simply click More options, enter Paris (any station) and a suitable stopover duration. Alternatively, if you prefer you can book London to Paris at www.eurostar.com then book Paris to Munich at the German Railways site www.bahn.de but it should make little or no difference to the price. Step 2, book the sleeper from Munich to Zagreb at www.bahn.de and print your own ticket. Step 3, Zagreb to Belgrade cannot be booked online, just buy at the station in Zagreb, this won't be a problem. Step 4, the Belgrade-Sofia train cannot be booked online, so either buy it at the station in Belgrade when you get there (there will always be places available) or buy it by phone as above, or perhaps arrange it via Belgrade's ex-Wasteels Mr Popovic. Step 5, the Sofia-Istanbul night train cannot be booked online or indeed booked by phone anywhere outside Bulgaria, so simply buy the ticket at the international ticket windows at Sofia station when you get there, there are always plenty of free places - I had a 6-berth couchette to myself! Deutsche Bahn's UK line on 08718 80 80 66, lines open 09:00-20:00 Monday-Friday, 09:00-13:00 Saturday & Sunday. They (obviously) use the German Railways reservation system but on the plus side don't charge a booking fee, just a 2% credit card fee. Tickets can be sent to UK or Irish addresses, or (for a fee) overseas addresses. Just be aware that their staff aren't always familiar with complex bookings like this and may need gentle persuasion. You will need to talk them through exactly what train bookings you want, and be polite but persistent if necessary. Sit back with a glass of red and enjoy the ride - book an upper deck seat for the best views. The train is equipped with power sockets for laptops & mobiles at all seats in both classes, and a cafe-bar serves drinks, snacks & microwaved hot dishes. First class passengers on this route are given a simple but tasty meal box with a small bottle of beer or wine served at their seat, included in the fare. The train soon leaves the Paris suburbs behind and speeds across a vast wide open plateau of woods & farmland at up to 200mph, past picturesque French villages of the Champagne region. An hour or two later, the train leaves the high-speed line and slowly meanders through pretty wooded hills, the countryside eventually flattening out towards Strasbourg. On leaving Strasbourg, look out for Strasbourg cathedral on the left with its famously missing second tower. Minutes afterwards you rumble across the river Rhine into Germany, before heading on to Stuttgart & Munich. This modern sleeper train is a pleasure to travel on, whether in the privacy of your own sleeper or in economical couchettes. There's time for dinner in Munich before boarding. 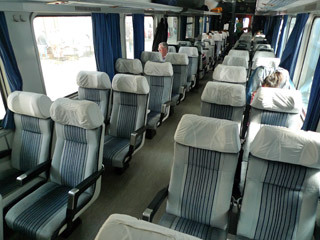 This is a spacious and comfortable air-conditioned Serbian train, with modern 2nd class seats - there's no 1st class. There's no restaurant car, so take a picnic and some beer or wine with you. On arrival in Belgrade, you have time to wander into town, perhaps visit the fortress overlooking the confluence of Danube and Sava, have a coffee at the Hotel Moskva (free WiFi!) and perhaps dinner at the basic but remarkably cheap Zelturist restaurant in the corner inside Belgrade station. This train has only two carriages, it's old and graffitied but comfortable enough. Power sockets, WiFi, even catering? Forget those! Bring your own picnic and bottles of beer, and buckle up for an old-school ride through the Balkans on the route of the Orient Express. If you get any more photos of this particular train or especially the scenery please let me know! In summer this train runs direct, in winter it's a series of connecting trains, one even has air-con(!). The Belgrade-Sofia train, currently summer-only, at Topcider station in Belgrade. Just two coaches, one Bulgarian, one Serbian, but comfy enough in spite of the graffiti. Bring your own food & drink and enjoy a scenic run across the Balkans. Photo courtesy of Matthew Woodward - see more photos & an account of this journey on his blog. 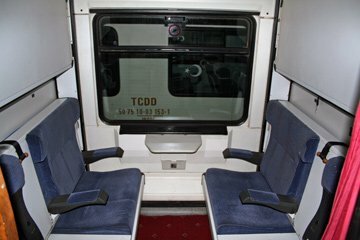 2nd class seats in the Serbian car. Photos courtesy of Remco van der Kort. 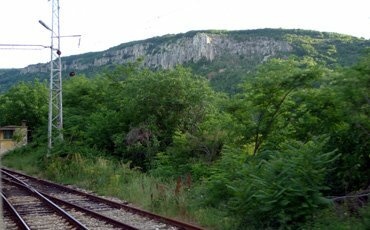 The train snakes through a gorge east of Nis, photo taken from the rear carriage. Courtesy of Matthew Woodward. This is now a decent train, with smart air-conditioned Turkish TVS2000 sleeping-cars with cosy carpeted 1 & 2 bed compartments plus an air-conditioned Turkish TVS2000 couchette car with 4-berth compartments. The sleepers have a washbasin in each compartment and even a small fridge to keep your been cold! But bring your own picnic and beer, as there's no catering on the train. You have to get off the train at the Turkish border to have your passport stamped, but you will still get some sleep. An air-conditioned Turkish TVS2000 sleeping-car as used on the Sofia-Istanbul Express. Comfortable, carpeted, with compartments bookable as singles or doubles. 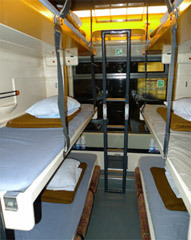 Above right, a sleeper compartment shown with beds folded away and seats folded out. The Sofia-Istanbul Express usually has two couchette cars. One is an air-conditioned Turkish TVS2000 couchette car with comfortable 4-berth compartments, shown above left with beds folded away and seats folded out. The other couchette car is an older non-air-con Bulgarian couchette car with 6-berth compartments. Exterior shots courtesy of Paul Bateman. The free transfer bus from Halkali to Istanbul, arrived outside Istanbul Sirkeci station. Courtesy of Philip Dyer-Perry. This is worth knowing about if you need to travel at short notice when Eurostar is expensive, or if there are any problems affecting the Channel Tunnel or Eurostar, if you want to avoid the Tunnel, or simply want to travel via Amsterdam. Simply book an overnight journey from London (or any Abellio Greater Anglia station) to Amsterdam by Dutch Flyer train+ferry service as shown on the London to the Netherlands page. Then book daytime trains from Hoek van Holland or Amsterdam to Munich from €39 using www.bahn.de. In Munich you can pick up the route via Bucharest or the route via Zagreb, Belgrade & Sofia as shown above. If you prefer, you can travel London-Brussels-Cologne-Vienna-Budapest instead of London-Paris-Munich-Budapest, it makes relatively little difference to the time or cost, see the London to Hungary page for details of train times, fares & how to buy tickets. You take the 12:58 Eurostar from London to Brussels, a connecting high-speed Thalys train to Cologne, the Austrian Nightjet sleeper train from Cologne to Vienna and a connecting Railjet train to Budapest. From Budapest onwards you join the route via Bucharest shown above, or indeed you could travel from Budapest to Belgrade and travel via Sofia. You can travel from London to Zurich by Eurostar & TGV via Paris. There's then a direct Croatian sleeping-car leaving Zurich around 20:40 and arriving Zagreb around 10:30 next morning, picking up the same late morning train to Belgrade shown in the route via Belgrade & Sofia above. The disadvantage is that (a) it takes an hour longer, as you need to leave Paris at 14:23 to Zurich instead of 15:55 to Munich, you arrive Zagreb two hours later so don't get a chance to have breakfast there, and (b) it may cost more. However, you get into your cosy sleeper at Zurich at 20:40 instead of having to stay up till 23:20 at Munich and you see great scenery in Austria which you pass through at night on the Munich-Zagreb run. If you want to see Vienna & Budapest, but then go onwards via Belgrade & Sofia, no problem. There are two options for travel from London to Belgrade via Vienna & Budapest, see the London to Serbia page. From Belgrade onwards, simply follow the route shown above. In 2010 there were two ferry companies sailing from Italy (Brindisi or Ancona) to Cesme in Turkey, about 50 miles or one hour by bus from Izmir. The companies were Marmara Lines (www.marmaralines.com) and Meslines (www.ferries.gr/mesline/brindisi-cesme.htm). The voyages took 2 days. 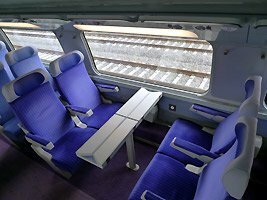 See the London to Italy page for train travel from London or Paris to Ancona or Brindisi. However, neither company seems to have run since 2011. If you're heading for southern Turkey, for example, Bodrum or Marmaris, this can be a better route than heading to Istanbul overland by train. Step 1: Travel from London to Athens by train & ferry via Bari in Italy, see the London to Greece page for full details. The journey takes 2 nights. I'd recommend spending at least 1 night in Athens. Step 2: Take a ferry from Piraeus (the port of Athens, 25 minutes from central Athens by metro) to either Kos, Lesvos (the port on Lesvos is Mytilini), Samos (the port is Vathi) or Rhodes (Rodos in Greek). For Piraeus-Lesvos (Mytilini) see www.hellenicseaways.gr to check sailing dates, times, fares and to book online. The voyage takes 9.5 hours. For Piraeus-Kos or Piraeus-Rhodes see www.bluestarferries.gr to check sailing dates, times, fares and to book online. Ferries normally sail Piraeus-Rhodes overnight, often calling at Kos very early, with cabins available. For Piraeus-Samos see www.kallistiferries.gr. Step 3, take an onward ferry to southern Turkey. Ferries from Rhodes to Marmaris sail several times a week, see www.marmarisferry.com or rhodes.marmarisinfo.com for details. Journey time 1 hour by catamaran, 2 hours by car ferry. Ferries sail from Lesvos (Mytilini) to Ayvalik in Turkey daily Monday-Saturday, crossing 1 hour 10 minutes, fare €30. Ayvalik is a few hours by bus north of Izmir. A hydrofoil sails around 15:30 every afternoon from Kos to Bodrum, fare €28, crossing 1 hour, see www.bodrumexpresslines.com. Ferries sail from Samos to Kusadasi at 08:30 & 17:00 from April to October, 1 hour 15 minute crossing, fare €30 (€50 open return), see www.meandertravel.com/ferrytosamos to check times, dates & fares. I recommend using this technique to plan out your itinerary to make sure everything works, and you book the right trains and ferries for the right dates! Many travel agencies offer holidays to Turkey by air, but if you want to go by train, you've always had to organise the journey yourself. For many people that's a daunting task. But rail specialist Railbookers can usually do custom-made holiday packages combining one-way or return train travel from the UK to Istanbul with stopovers & accommodation in key cities along the way. It's the easiest way to see Istanbul & Turkey without flying: Just tell them your departure date and they'll do the rest. Please double-check the price & itinerary when you call them, as they may vary from the examples shown here. You can leave on any date you like, unescorted using the same scheduled European trains that you'll find described above and on the Austria & Romania pages, but with tickets, accommodation & itinerary all provided for you by Railbookers. Railbookers can arrange a train journey from London to Istanbul (or vice versa) for you to your own specification, with all your train tickets, reservations, stopovers, transfers and good-quality hotels booked for you. Their website shows some suggested itineraries and prices. 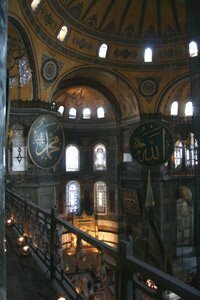 London to Istanbul one-way in 7 nights with stopovers in Budapest (2 nights) & Bucharest (1 night) costs from around £889 per person for 2 people sharing, including private 2-berth sleepers and a one-way flight back from Istanbul to the UK (they can also arrange it without the flight at reduced cost). Daily departures on almost any date you like. The price includes lunchtime or morning Eurostar to Brussels, Thalys to Cologne, 1 night sleeper on the overnight train from Cologne to Vienna, 2 nights at the 4-star Novotel in Budapest, 1 night sleeper on the overnight train Ister from Budapest to Bucharest, 1 night 4-star Hotel K & K Elisabeta in Bucharest and 1 night in a sleeper on the Bosfor to Istanbul, plus flight back to the UK Upgrades to first class on Eurostar or deluxe sleeper with shower on the Cologne-Vienna train are possible at extra cost. You can vary the route, add extra stopovers or extra nights to meet your own requirements, just tell them what you want. 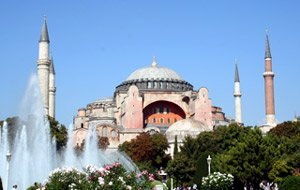 London to Istanbul round trip by train in 14 nights with 1-night stopovers outward in Munich, Budapest, Bucharest, 3 nights in Istanbul, then 1-night stopovers on the return in Brasov (for Dracula's castle), Vienna and Nuremburg. Daily departures on almost any date you like, from £1,549 per person. Epic 14-night trip from London to Budapest, Bucharest, Istanbul, Izmir and Kusadasi, out overland by rail, back by air, from around £1,349. They can easily arrange both ways by rail at extra cost if you like. Daily departures on almost any date you like. Railbookers can also arrange a round trip by train to Istanbul, with a similar journey in the return direction at a similar price. You can vary the stopovers on the return if you like. The Venice Simplon Orient Express runs from Paris to Istanbul once a year, usually in August, with vintage 1920s Wagons-Lits sleeping-cars, restaurant cars and lounge. The journey costs around £5,000 per person, but it's very popular and normally leaves fully-booked, so buy tickets as soon as you can. To find out more about this train, see the Seat 61 Venice Simplon Orient Express page. To check prices & to book online, go to www.belmond.com/venice-simplon-orient-express. There are some excellent modern train services in Turkey. For train travel within Turkey, including onwards express trains from Istanbul to Ankara, Konya, Izmir, Cappadocia and Pamukkale, see the Train travel in Turkey page. To get the most out of your trip, definitely take a good guidebook - I'd recommend the Lonely Planets guides as about the best out there for independent travellers. The Middle East guide is less detailed, but covers Egypt, Syria, Jordan, Iran, Israel and other countries as well as Turkey. 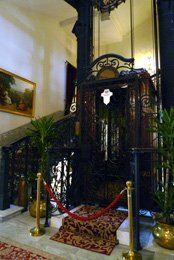 Without a doubt, the famous and historic Pera Palas Hotel, where Agatha Christie, Mustafa Kemal Attaturk and even King George V have stayed, is the most interesting place to stay, see the section below. It wasn't that expensive, by grand hotel standards, although prices have risen after its recent complete refurbishment. The nearby Grand Hotel de Londres offers similar affordable grandeur, www.londrahotel.net, just 35 euros for a basic single, 50 euros for a double, more for a renovated room. It's apparently a favourite with archaeologists working in Turkey! Alternatively, the Yasmak Sultan is a good choice. For a good cheap hotel in the Sultanahmet travellers' area, try the Park Hotel. If you are on a tight budget and want a backpacker hostel room or dorm bed at a rock-bottom price, see www.hostelworld.com. 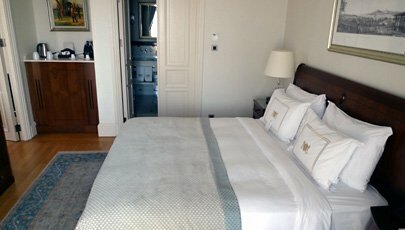 For independent reviews of Istanbul hotels, see www.tripadvisor.com. 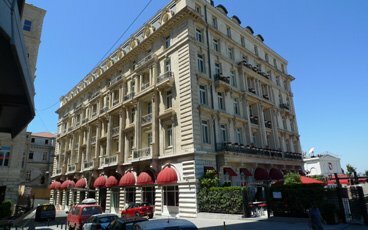 The Man in Seat 61 says: "Istanbul's famous Pera Palas hotel is a classic, one of my favourite hotels anywhere - admittedly much pricier after its refurbishment, but now a true 5 star hotel with helpful & friendly staff. It's a special place for my wife and I, it just happens to be where I told my wife she was pregnant with our first child, after the hotel's duty manager translated a certain Turkish word..."
The Pera Palas hotel, after its recent refurbishment.